My experience with figs has been limited almost exclusively to fig newtons. I just wanted to get that out of the way. Then out of nowhere, I just really wanted to try figs. Perhaps it was because I was being bombarded with yummy fig ideas. First it was a fig and cheese sandwich I saw at a restaurant (although it wasn’t vegan). Then I came across this recipe. When I passed a box of fresh figs at the market, I had to buy them. So the sandwich. It’s just a basic grilled cheeze with some sliced figs inside and a bit of spicy mustard just for fun. So good! I may have had a few of these. And by that, I mean I did. 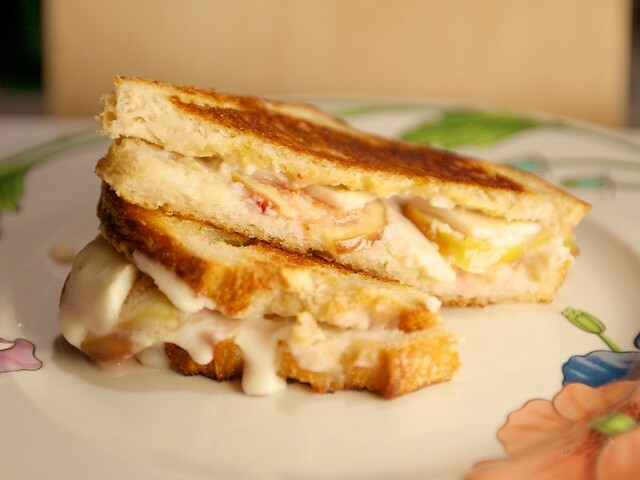 Cheesy and delicious with just a hint of sweetness from the figs. Next up was the fig upside down cake. Part of what excited me about this recipe was making a cake in the cast iron skillet I just recently acquired. I’m a big fan of any multi-use cookware. Not to mention for those of you looking for a little more iron in your diet, cooking in an iron skillet will actually add some iron into your food. See, cake can have health benefits! The cake was delicious; decadently sweet with a rich brown sugar flavor. I opted to make my own brown sugar by mixing molasses into regular granulated sugar,which definitely gave the cake it’s own distinct flavor (and more iron!). I probably could have let it cool a bit longer so the figs were not so juicy when I flipped it, but it’s not always easy waiting for cake. Topped with coconut whipped cream, this easy cake could be a treat on a night in or a fancy dessert for guests. 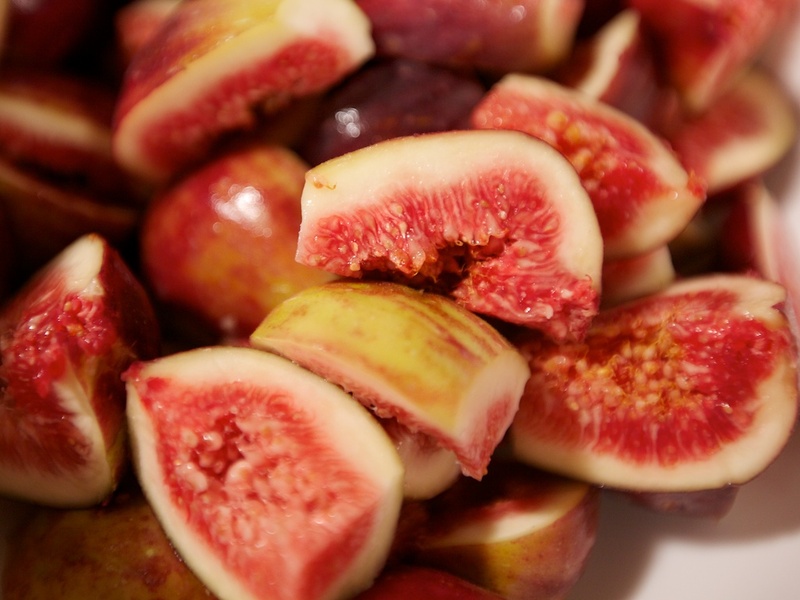 Mix figs and sugar in a bowl and set aside. Melt the Earth Balance in an iron skillet on medium heat. 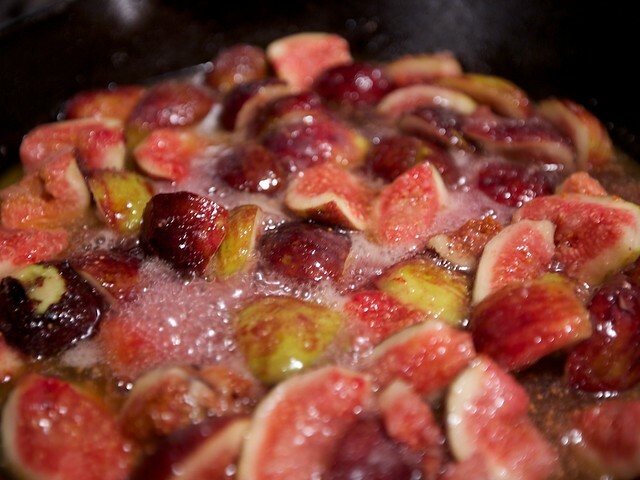 When it is warm, add the figs and sauté until softened, about 5 minutes. Beat the vinegar into the almond milk until frothy and set aside. Mix the oil and sugar until combined. In a separate bowl, mix all the dry ingredients, using a whisk. Combine the sugar, dry ingredients, and soy milk. Mix until there are few lumps. Pour the batter over the figs in the skillet. Bake for approximately 35-40 minutes. Remove from oven and let cool for at least 30 minutes. Invert on plate and serve. I highly recommend adding some whipped coconut cream topping. I just bought my first figs ever today! I want to try this sandwich so badly…it looks amazing! yum!!! i want to make both of these.. which kind of vegan cheese did you use? Oh man, do I love figs! I’ve never cooked with them, though, because I’ve never managed to last that long without devouring the whole container! That upside down cake looks like it’s worth learning some self control. 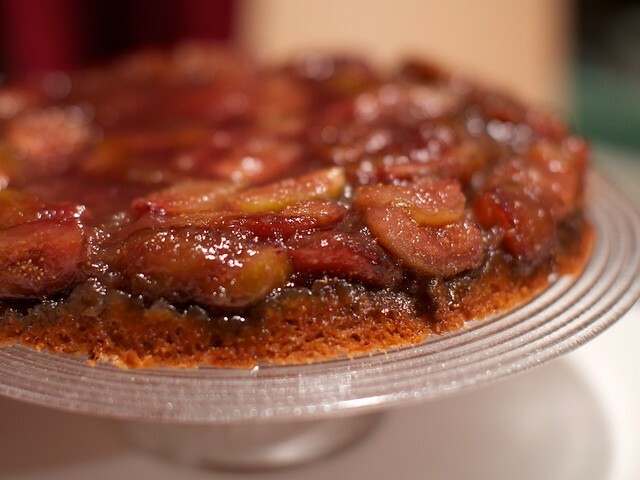 This looks delicious – I have never baked with figs, but this recipe will be in my imminent future. Thanks for sharing! Figs are so pretty! We got them in at work and I always want to take them home but I’m not a fan of them plain fresh. Both of these recipes look awesome! I am totally looking forward to working tomorrow so I can pick up some figs!